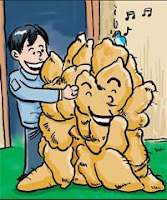 Fu Chunmei has been attracting curious onlookers to her home in Danzhou, Hainan province, ever since she unveiled a cassava that weighs more than 30 kg. The cassava is 50 cm high and 30 cm wide and appears to be the biggest such plant ever cultivated in Hainan province. Fu said she planted the cassava in her sugar cane field about a year ago. The "king of cassava" has attracted not only relatives, friends and neighbors, but also experts in the past few days.